In fact, I want to get my biggest criticism out of the way first: Grace’s death. I suspected it was coming fairly early on. It is clearly signposted. However, I kept hoping Chibnall would subvert expectations here. To be fair, I do think it’s handled well. It’s very emotional and I really like that we see her funeral—and the Doctor sticks around for it! The Doctor normally nips off before funerals. Her staying says a lot about this incarnation—something I’ll talk about in more detail when I cover the specifics of this Doctor’s character. 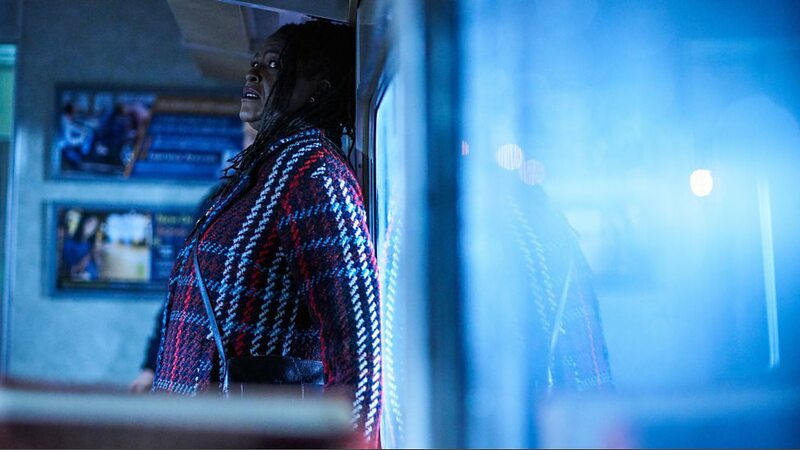 Grace is a great character: wise, fun, and adventurous (and played fabulously by Sharon D. Clarke). She quickly became my favourite character, and judging by the reactions of people I know and people in the jam-packed theatre showing I attended, she quickly became many people’s favourite character. Indeed, she’s clearly designed to be people’s favourite. It makes her eventual death more affecting. I confess I shed more than a few tears at her passing. It is really very effective. 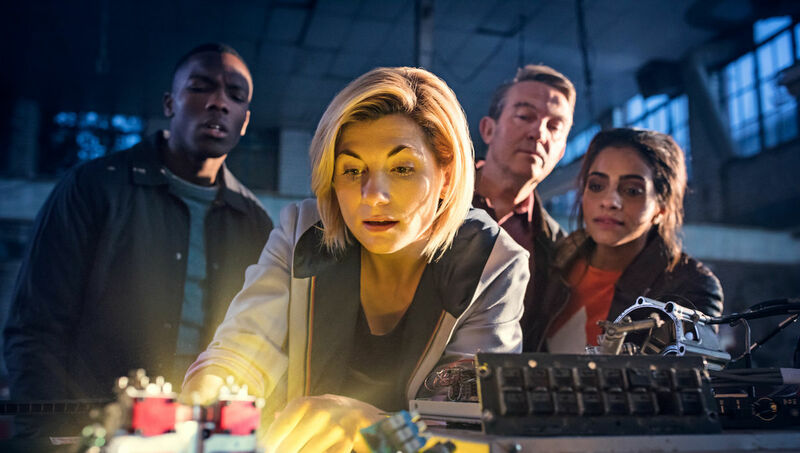 Unfortunately, Grace’s overall role in the story is as a motivating factor for both her husband Graham, and her grandson Ryan—both destined to become new companions to the Doctor—and her death’s only function is to push forward the stories of those two characters, not her own story. She doesn’t even have her own story. Quite simply, she is fridged, a term used to refer to the killing of a character for the sole purpose of advancing and/or motivating another character’s story. This is something that happens almost exclusively to women and it’s almost always to advance a man’s story. In this case, it’s to advance two men’s stories. Compounding this is the fact that Doctor Who hasn’t had the best track record when it comes to the fates of black characters. The last two significant black characters (Danny Pink and Bill Potts) both had their stories end by being turned into Cybermen (though Bill did get a magic return to life). 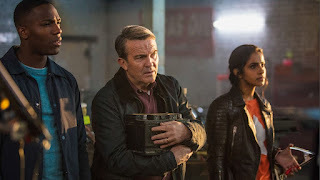 I talk a little bit about the problematic issues of this in my review of “World Enough and Time” (the episode when Bill is turned into a Cyberman), and to reiterate part of what I say there, I am not saying that women and characters of colour should never die, but writers absolutely should be aware of repetitive tropes that keep happening over and over. That aside, I do look forward to seeing how her death affects the relationship between Ryan and Graham. I like the family dynamics that have been set up with Ryan being not quite willing to accept his step-granddad yet. I also like that, through Grace and Graham, we get to see an older couple with an adult relationship. This is a demographic not often represented in television and film. Another demographic not often represented are people with non-visible disabilities. Ryan’s dyspraxia makes a compelling addition to the show. 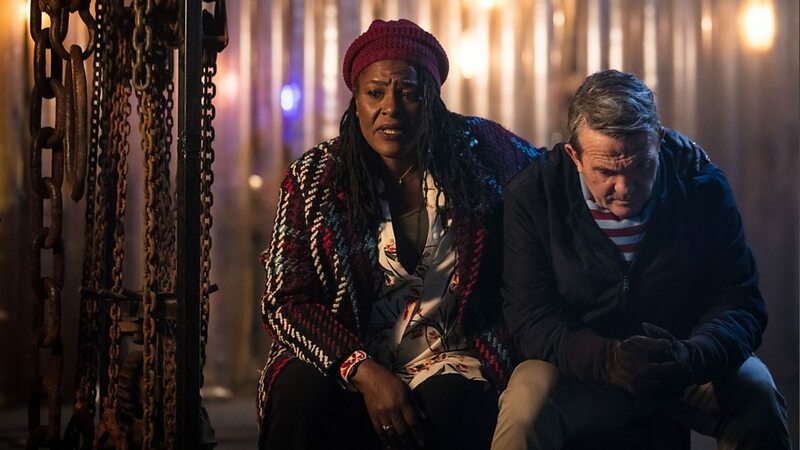 There has never been a companion with a disability on board the TARDIS before (and yes, I know, since the TARDIS hasn’t shown up yet, technically there hasn’t been one yet). I look forward to how this plays out over the long term. I confess I didn’t know much about dyspraxia, and this episode has led me to research more about it. I like when fiction makes me learn things. Chris Chibnall (who has a nephew with dyspraxia) worked with the Dyspraxia Foundation to help ensure an accurate and sensitive presentation of the disability. One of the things I really like about how this episode deals with it is, when Ryan vows to finally learn to ride a bike after Grace’s death, he doesn’t succeed. He keeps trying and keeps falling. Too many other shows would have had him succeed through sheer will-power, motivated as he is through his grandmother’s death. But that’s not how the real world works. Disabilities are not so easily overcome. Going back to what I said earlier, it’s one of the many things that helps keep this version of Doctor Who grounded. There are no magical solutions here. In many ways, that particular bike scene is the most moving part of the episode, even more so than Grace’s death, made all the more powerful when the camera pans away to show the Doctor watching from the distance—and not interfering. 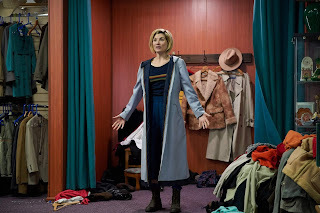 Speaking of the Doctor, as this is a post-regeneration episode where she is suffering from post-regeneration sickness, it’s hard to get a clear idea of exactly how she’ll turn out, but there are some definite hints. In particular, this is an incarnation more aware of human niceties than her previous incarnation was (at least at the start). Not only does she stick around for Grace’s funeral (the Doctor has never liked dealing with consequences and tends to skip town before having to), she shows more immediate concern for the effects events have on her companions than most of her other incarnations would. After finding the horribly mutilated body of Rahul, one of her first responses is to apologise to everyone that they’ve had to see this. Yet she still has some of that Doctor-ly arrogance to her, seen when she takes offence at the villain’s suggestion that she has a small mind. There’s also a bit of a child-like, mischievous quality to her, seen in moments like when she asks Yaz if they can turn on the police car’s lights and siren. When Yaz says no, the Doctor visibly pouts. She’s also a very hands-on Doctor. This might, in part, be because she doesn’t have access to the TARDIS and doesn’t have any choice but to build things herself, but nevertheless, I love that she builds her new sonic screwdriver herself, and rewires alien technology and a microwave oven into a teleporter. The sonic-building sequence is one of the highlights of the episode, filled with some great humour. I hope the tinkerer aspect of her sticks around. Of course, we’ll learn more about this Doctor as the series goes on and she settles into her new personality, but for now, I really like what we’ve seen of her. As I stated earlier, Whittaker is great in the role, and she will no doubt settle even more into it as time goes by. The new companions—or rather, friends, as they are now being emphasized as—are all good characters in their own rights, and I’m interested in seeing how they develop. There’s good contrast between them, too. Ryan wants to better himself, but is filled with self-doubt. Yasmin is the confident one, desperate and impatient to do more than she’s been given. She is also, unfortunately, the least well-served in this episode with the least to do. Hopefully, she’ll get more moments to shine later on. Graham doesn’t really want adventure, but is thrust into it and has to make do. Graham is also the oldest companion the Doctor has ever had (not counting non-human characters with extended lifespans like Romana or Nardole and not counting characters from other media like Big Finish audios or comics), so that will also make for an interesting new dynamic. The plot of “The Woman Who Fell to Earth” is very straight-forward, which serves it well as the episode is mainly about introducing the characters and there isn’t space for convoluted alien invasions. So we get a simple Predator-like story about an alien hunting down a specific human. The episode still manages to maintain a good sense of threat as this alien doesn’t hesitate to kill those who get in his way. It’s also rather nice to have a story that’s at such a smaller scale, instead of every story involving conquering or destroying entire worlds. The villain is rather one-dimensional, primarily being evil for evil’s sake, but again, this works for this particular episode as it allows more time to develop the principal cast. I wouldn’t want this kind of one-dimensional character every week, but I’m fine with it here. The episode is surprisingly gruesome. Even though we never actually see any of the gore, just the indication that the villain is ripping out his victim’s teeth (complete with cracking sound effect) is more than we typically get in modern Doctor Who, and is yet another significant change in the show. That said, while I like the Doctor’s response, I am a bit disappointed that this moment is never followed up on. We don’t see Carl again after this, and while this episode is a wonderfully accessible jumping on point for new viewers, I fear this moment is one of its less accessible moments as new viewers may not understand the Doctor’s response. To many people, Carl’s actions will seem perfectly justified. He has just been the target of an alien hunt and nearly dragged away to another planet to be placed in suspended animation “between life and death”. It’s not surprising that he would lash out at his would-be kidnapper. But long-time viewers will know that the Doctor doesn’t condone these types of attacks. 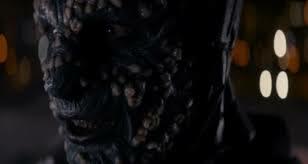 Tim Shaw had already been defeated by his own actions (which the Doctor tricked him into) and was no longer a threat. 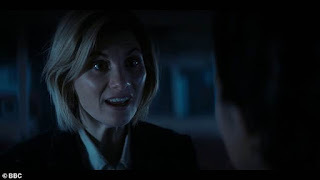 The Doctor’s reaction is perhaps one of the most key moments indicating she has fully settled into her new incarnation and has truly become the Doctor, but new viewers won’t have the context to understand her actions and realise that they are very much in character. That said, this is a relatively minor criticism of the episode. Another criticism I have is that some of the dialogue in this episode is rather clunky. There are some moments of rather lengthy exposition, including the moment when Tim Shaw just tells the Doctor and friends all his plans instead of trying to kill them. Beyond the story and characters, there’s more that’s new in “The Woman Who Fell to Earth”. The new cameras and filming style give it a very cinematic feel, which is also helped by the wider aspect ratio (2:1 instead of the 16:9 ratio used since 2005). Indeed, I don’t think Doctor Who has ever looked so good. New composer, Segun Akinola brings a markedly different style of music to Murray Gold, who did the music from “Rose” in 2005 to “Twice Upon a Time” at the end of 2017. It’s reminiscent somewhat of some of classic Doctor Who’s incidental music in the 70s and 80s. There’s heavier use of electronics and it’s often more subdued than Gold’s music. It creates a very different sort of atmosphere. I always liked Gold’s music, but he was around for a long time, and it’s nice to hear a new style now. Change is an integral part of Doctor Who, after all. I also really like Akinola’s rendition of the theme music, which makes its début at the end of this episode, since there are no opening titles. Long-time readers of my reviews will know that I could be quite critical of Steven Moffat’s Doctor Who. Although I do think there were some key improvements towards the end of his time and even though I really liked Series 10 (Bill will always be one of my favourite ever companions), it’s probably not surprising that I highly welcome the change of showrunners. But honestly, it’s not just criticisms of Moffat that lead me to this. 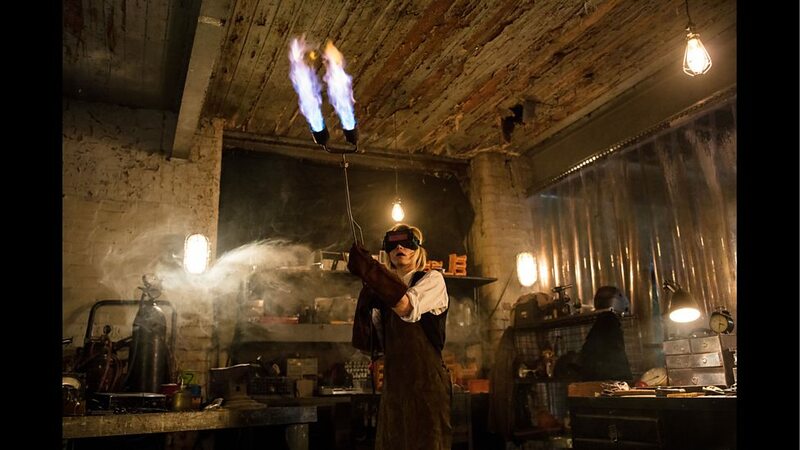 Change is integral to Doctor Who, and the time has come for change. 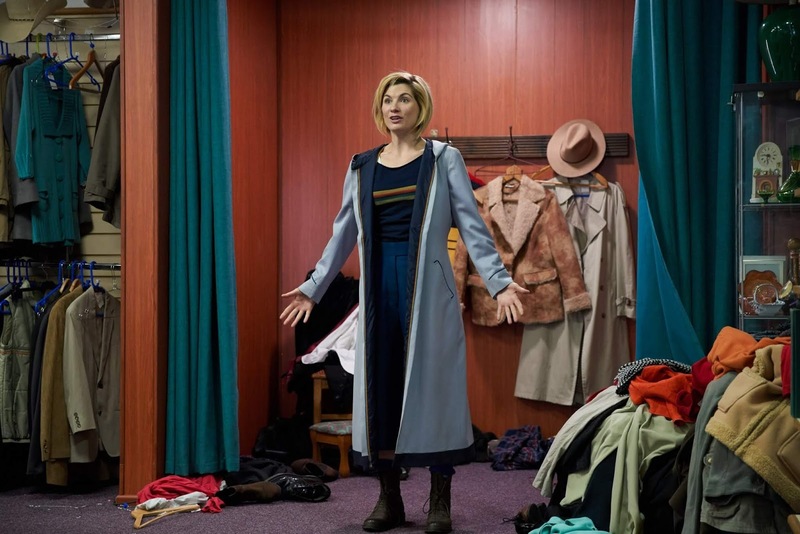 If “The Woman Who Fell to Earth” is at all indicative of the change that Chris Chibnall is bringing to the show (and I am confident that it is), then this is change for the good, and I am super excited for what is to come—more excited than I’ve been for Doctor Who in a long time. For me, Doctor Who is well and truly back, and it’s about time.